1857 – The first section of the Minmi – Hexham Railway opens between Hexham and Minmi. 1888 – Shaft sinking at Richmond Vale Colliery commences. 1890-95 – Unsuccessful attempts to refinance the colliery. 1897 – Richmond Vale Colliery purchased by J & A Brown. 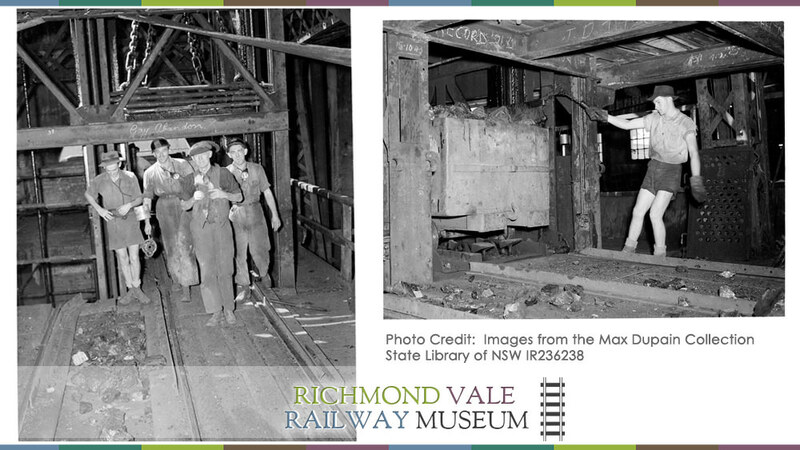 1904-05 – Extension of the railway from Minmi Junction to Pelaw Main and Richmond Main. 1911 – Colliery renamed to Richmond Main. 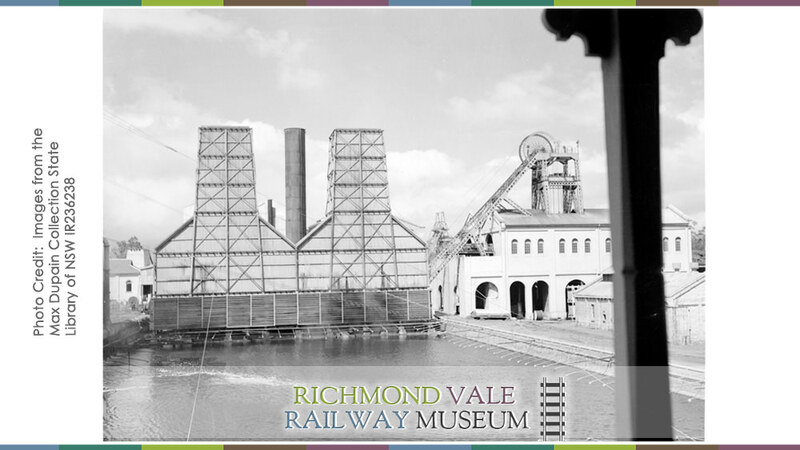 1914 – Coal production commences at Richmond Main Colliery from the Homeville seam. 1922 – The direct passenger line between Pelaw Main and Richmond Main opens. 1926 – Richmond Main Colliery sets the record of 3,482 tons wound up a single shaft in one 8-hour shift, which still stands today. April 1959 – Direct passenger service between Pelaw Main and Richmond Main ceases operation. 1976 – Richmond Main Power Station ceases operation. Cessnock City Council acquires the site to prevent complete demolition and clearing. 1979 – Richmond Vale Preservation Co-operative Society Ltd formed. Mid-1979 – Site clearing by volunteers commenced. 1980 – Society registered as a cooperative. Restoration of track underway. 1984 – Limited diesel-hauled passenger operations recommenced. 1986 – Locomotive Marjorie commences steam-hauled operation. 1988 – Four SMR 10-class locomotives gifted to the museum by Coal and Allied Industries. 1988 – New carriage shed constructed by the Society. Entry building constructed by Cessnock City Council. 1991 – Passenger operations resume between Richmond Main and Pelaw Main. 1997 – Locomotive service bay constructed adjacent to the loco shed. 1999 – Richmond Main Colliery listed on the State Heritage Register. 2015 – Miniature railway purchased for operation at the museum site. 2017 – Locomotive ROD23 placed on display in its World War 1 livery. 2017 – Gifting of ROD23 and Kitson tank locomotives 9 and 10 formalised by Coal and Allied Industries. September 13 2017 – Richmond Vale bushfire inflicts serious damage on the site and unrestored rollingstock exhibits. Rail services suspended. March 3 2018 – Rail services resume.